I haven't posted anything new here in more than a week, and I thought it was time to let you all know why. My dad was diagnosed in 2014 with multiple myeloma, which is a cancer of the blood plasma. He also has advanced Alzheimer's. He is now in the terminal stage of the myeloma; the doctors have said they've done everything they can, and we don't expect him to live much longer. We're hoping that he can come home sometime in the next few days, to spend whatever time he has remaining in familiar surroundings. 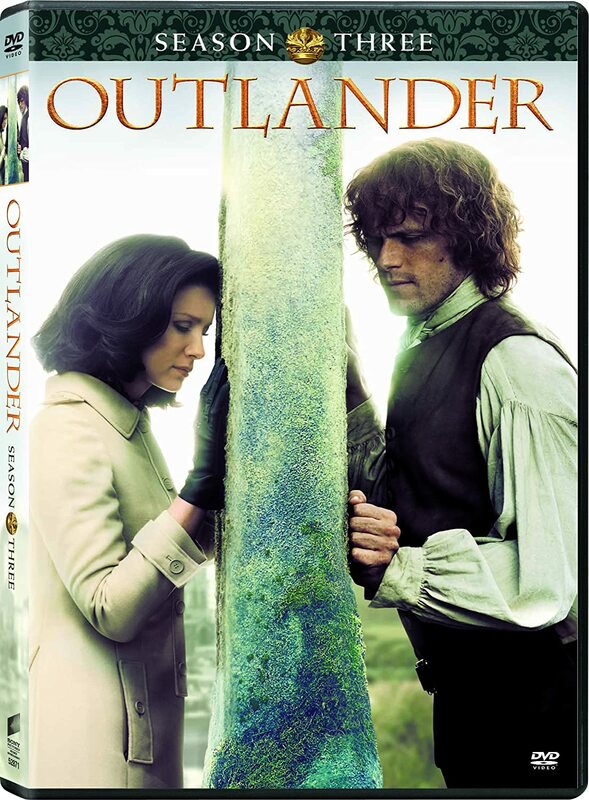 Under the circumstances, I have little interest these days in blogging about All Things OUTLANDER. I would rather spend what spare time I have focused on my dad's situation and helping my mom get through this. I'm lucky that I live nearby, so I can visit whenever I want to and help with whatever my mom needs. 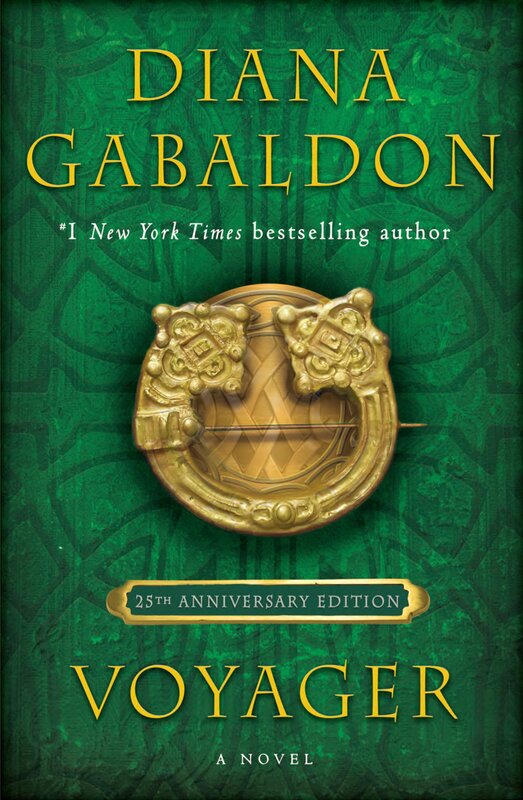 I will still post here if there are major announcements from Diana Gabaldon or STARZ, but I don't plan to do more than that, at least for the time being. UPDATE 9/18/2016: My dad passed away on September 16, 2016, at home, surrounded by his family. Here is his obituary in the Raleigh News & Observer. Thanks so much for all your prayers and good wishes! Karen, I am so sorry. I've been through this myself and know how hard it all is. I am praying for you and your family, for stamina and comfort. This is the roughest part of the process..waiting. I learned from Hospice that hearing is the last sense we lose so talk to him to the end. He will hear you, even when he can no longer respond. Prayers for his peace & for family's strength. Feel the energy of our good thoughts and prayers for you and your family. Take good care. So very sorry to hear this sad news. I'm certain I can speak for all of us who follow your blog that we are praying for you and your family to find peace in this trying time. Sorry to hear about your Dad, totally understand. I'm so sorry Karen! You take whatever time you need, we'll be here when you are able to return. Prayers for your Dad, Mom, you and the rest of the family. Very sorry to hear this -- of course, family always comes first. Sending comforting thoughts to you and your family during this time. So sorry to hear about yor dad. I will keep you and your family in my prayers. You will need all your strength for what you are facing. Wishing you comfort and peace. Hi Karen , please take as much time as possible , I have an aunt who is in the Hospital so < Outlander is the farthest thing from my mind as well so I understand very well , will say prayers for you , God Bless .Sincerely Yours. Take care Karen - you certainly have your priorities straight. Thinking about you. Thoughts and prayers are with you and your family. Been there and time with your Dad and family is something you will always remember. I'm so sorry. It doesn't matter how old you are or if it's "expected," we are never ready to let go of our parents. Big hugs to you, Karen. My heart goes out to you and your family, Karen. Prayers for strength to help you all through the next difficult days. Family always comes first, and we will keep you in our thoughts. I'm so sorry Karen. You and your family will be in my prayers. You have given so much time and talent to Outlander fans everywhere. We will be here for you when you are ready to come back. In the meantime, you have my heartfelt prayers for strength and courage in the coming days. ((((Karen)))) I am so sorry to hear about your father. I am sending prayers to you and your family. Peace be with you and your family, Karen. I pray the transition will be gentle for your Dad and all of you. Hello Karen... Please know that you are in our thoughts and prayers. May God's blessings be upon you and yours. Karen, Please know that all of our thoughts and prayers are with you as you move through this part of life's journey. My Dad had Alzheimer's and it was so difficult for all the family. I, too, was blessed to be able to be near and support my family. 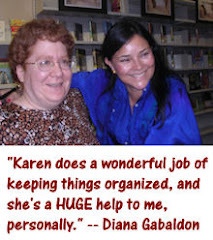 We are thinking of you - and are so very very grateful for all that you do for the Outlander community. Take good care of you. You and your family will be in my thoughts. Wishing you strength, peace and comfort for the days and weeks ahead. So sorry to hear about you father. I wish you and your family strength and peaceful moments with your dad. Our prayers are with you and your family Karen. This is always such a difficult time, waiting for the inevitable. Just now saw this. I hope your time with your dad (and mom) has been/will continue to be blessed in whatever way it can be. Thoughts and prayers being sent to you and yours. Will continue to keep you and your family in my thoughts. Your father was a remarkable man. Thank you for sharing this with us. Take care of yourself and your family now. 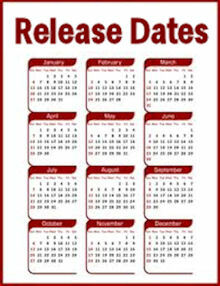 We will all be here to support you when you are ready to post again. Wishing you peace and comfort. dear Karen, I am keeping you and yours in my thoughts and prayers. So sorry for your loss. I lost my sweet dad years ago, but he always seems to be near me. Love is stronger than death. Hugs. Karen my heart goes out to you.. My thoughts and prayers are with you and your family. So sorry to hear of your loss. Prayers for you and your family. So sorry to hear about your dad. It's very hard to lose someone close to you, especially a parent. Stay strong for the rest of your family. I'm so sorry for the loss of your father--what a remarkable man. May peace be with you and your family. I'm so sorry. What a difficult process this must have been for you, your dad and your family as a whole. Given the circumstances, though, I am glad that he was able to pass on while at home, surrounded by all those comfortable and familiar things, and by so much love. I wish you and your family all peace as you mourn his loss.